Digimon: System Restore: Xros Wars Episode 73: The Great Undersea Adventure! Find the Treasure Digimon of Dreams! Xros Wars Episode 73: The Great Undersea Adventure! Find the Treasure Digimon of Dreams! In this episode, after all these years we finally find out why Dagomon never got a proper appearance in Zero Two. Seriously, have you actually seen this guy? We need to take a moment and attempt to wrap our heads around the fact that Tagiru just caught freaking Cthulhu. His mysterious presence in Zero Two was so ominous and so unexamined that it feels like any future appearance would be met with heavy anticipation, teasers and possibly an episode that ends with him in silhouette (wait, scratch that last one). It's pretty shocking that he shows up in yet another Hunters filler episode, much less that Tagiru would catch him like a goddamn common Pokémon. It's an unfair stigma, to be honest. Eliminate all that and Dagomon is just another Perfect level (not that level even matters in Xros Wars) inspired by some badass source material. And he's used appropriately here, terrorizing the deep seas as he is wont to do. He's very good at it too, as the initial shots of Mizuki's explorations are nice and suspenseful, with those damn red eyes and a repulsive/goofy body that doesn't like to appear in public all that much. If you can put aside Dagomon's history and origins, it's a perfectly... okay episode. Still Hunters and all. The fact that Airu is hunting innocent adorable Yuu instead of innocent adorable Digimon is probably supposed to be a sign of improvement. She's gone from yandere to tsundere, opting to forgo making mayhem on the shore and instead just being bored. Yuu is no longer going along with her antics, instead just talking to her, wondering why she's there and trying to simultaneously keep her in check and keep his distance. She does very little of consequence, so it's hard to figure out why we needed such a contrivance to get her involved. Her crush on Yuu is sort of cute, and we should be in favor of anything that gets him more screentime, but any mellowing out on her part serves to take her further out of the story rather than keep her active as a vicious antagonist. Clearly, the lesson here is that girls should give up on their passions and hobbies once the right boy comes along. 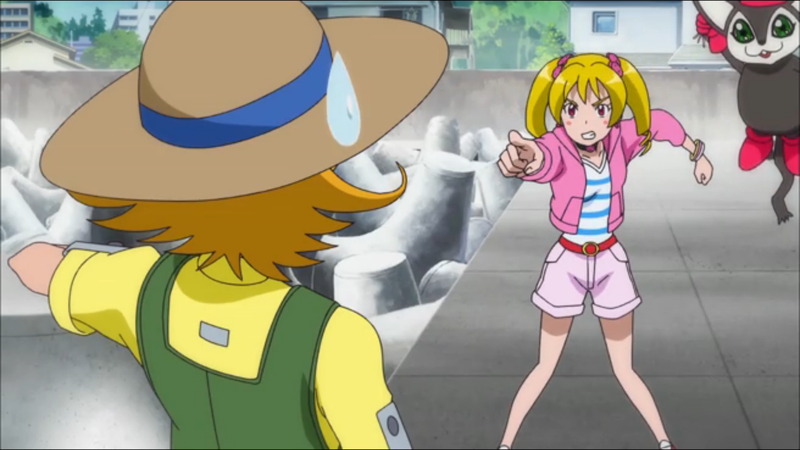 Mizuki, despite the odd flirting with Taiki at the end of the episode, is all about her passions and hobbies. She is so determined to clean up Dagomon's undersea mess that she accepts a Xros Loader and a Digimon partner without learning any of the details. She doesn't look like enough of a sociopath to be interested in the actual hunt, but her lack of follow-up questions is distressing. Random old dudes don't just go around handing out sentient submersibles to people. The clockmaker clearly just wants Dagomon out of the way, but he's still using Mizuki as a pawn and she accepts this far too easily. Usually the one-time kids in these stories are either trying to help or being manipulated. Despite the way the clockmaker plays Mizuki, she still falls under the first category as she leads the three boy hunters and their plus one into the depths. So we have the deep sea DigiQuartz atmosphere, Dagomon's foreboding presence, and more sunken ships than the Adventure fandom could ever concoct. It's a cool setting for this rather typical story. It feels more dangerous, like the stakes are higher. And while we've seen instances where the manipulated character ends up helping the team out, this is the first time we get to see the helper possessed in front of the team. What we end up with is Mizuki helping Dagomon invade Plesiomon's lair, where he wants to absorb it and its digiegg to gain more power. 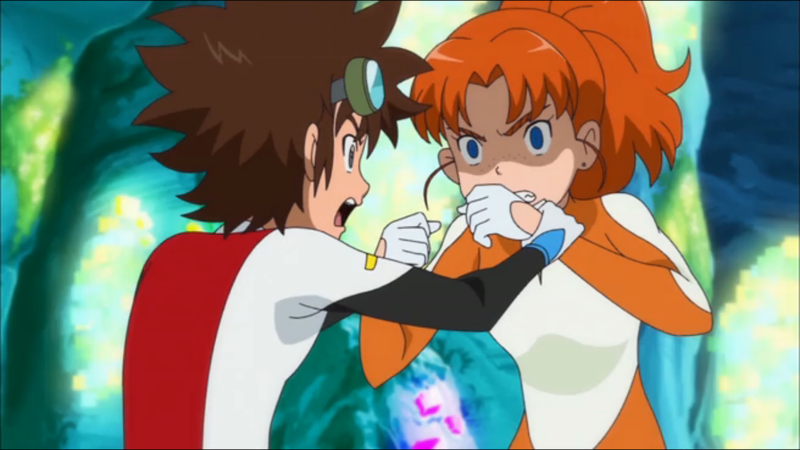 Taiki is forced to physically restrain Mizuki, making for a tense confrontation. There's more digixros action than we've seen in a long time, including Tagiru's extremely risky GigaBreakdramon gambit. It's all quite solid. It's just weird to seeing Dagomon in real action, even weirder that he loses, and even weirdest that he ends up in Tagiru's Xros Loader. But it's not like Tagiru's going to use him. You know Dagomon's just going to sleep in there the whole time. It should be completely reasonable to accept that Airu's family dragged her to the ocean, but it raises so many questions about Airu's family (and by extension, Ren and Ryouma's). Do they know what she gets up to? What's she like at home? Is her little brother victimized by her traps? Also, Opossumon is out of her Xros Loader pretty much the entire time on the shore. How much cleaning up is Mizuki really expecting to do in that ship graveyard? She can claim a few trinkets, sure, but those vessels are down there forever. While diver training isn't always the most extensive process, Mizuki is almost certainly not certified to teach and the kids are almost certainly not licensed to dive. Which makes you wonder who rented them those snazzy color-coded diving suits with Tagiru and Taiki's shirt emblems. If Dagomon is minding his own business under the sea and the barrier can only be opened by humans and humans can be manipulated from DigiQuartz... why send humans down there? 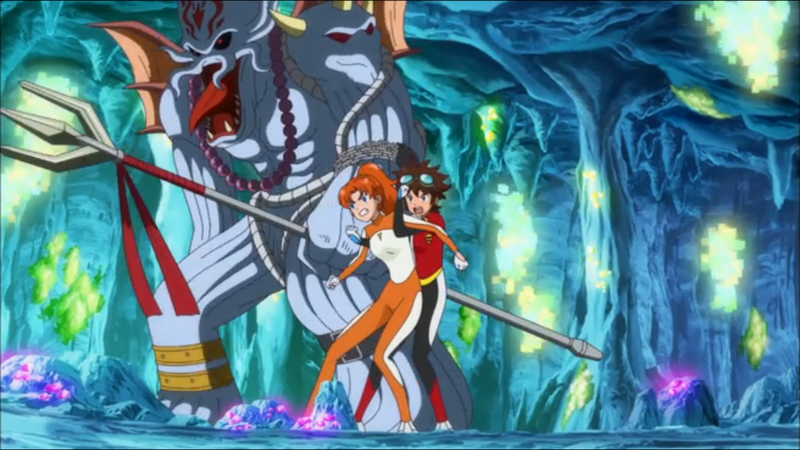 If only humans can open the barrier, then why would Dagomon's trident work on it, even after humans put a hole in it? Airu is repeatedly seen showing total disgust at Dagomon's appearance, even though it's pretty cartoony as far as portrayals of Cthulhu go. Her protests at seeing him sound almost like she's being censored and the original version had her saying something really terrible. This is what, the third episode now where Yuu had to dive tackle Airu to save her life? They could be a little less blatant about this thing. This is also the second consecutive episode with a fantastical interpretation on a plesiosaur. That's an oddly specific thing to feature in two straight episodes. Given your comments about censorship from that Phelesmon episode a way back, I'm wondering what would have happened if 02 had shown Dagomon and made the Cthulu references more explicit. It's not exactly considered kid-friendly material. Also, I'm as disappointed as you are that a villain this awesome has been reduced to a boring monster of the week, though it was nice to see Submarimon and ChibiKamemon again. That "subtle evil" vibe at the start was appropriate, but it wasn't enough. So much wasted potential, though, and then there are things just left unexplained. Why was that DigiEgg so important, for starters, and - cute though it was - what was the point of having Airu on the trip? Why did the Clock Shop guy recruit Mizuki when this episode makes it clear she's not even remotely committed to hunting Digimon? And the GigaBreakdramon drama sure dried up in a hurry, didn't it? Watching Airu's first big episode, where she's portrayed as a legitimately menacing psychopath trying to get Cutemon, then watching this one is surreal, but makes a point: she's one of the few characters in this show to actually change. It may have not been written ideally (the unfortunate implications this review mentions concerning Ewan are definitely bothersome), but for this show it's SOMETHING at least, which is more than I can say for certain other characters. Oh, I think Ewan is absolutely aware that Airu is obsessed with him. He's just so used to it with Mami and company that he simply shrugs it off.